In New Brunswick, people who have an intellectual or developmental disability face rates of mental illness that are three to four times higher than the general population. People with an intellectual disability also face many risk factors for developing mental health concerns throughout their lifetime but, for them, such issues often remain undiagnosed. Front-line health and service professionals often have not received specialized training, and may not feel adequately prepared to work with or provide services to individuals with the dual diagnosis of an intellectual disability and mental illness. This situation prompted NBACL to develop a special training eBook, entitled Supporting People with Dual Diagnosis. 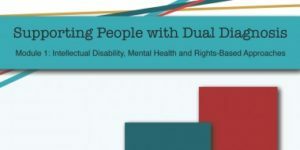 The eBook is intended to help those working with individuals with Intellectual disabilities to understand this population’s vulnerability to psychological stress and the development of mental health concerns. The training modules are designed to provide foundational information and knowledge regarding dual diagnosis, as well as person-centered approaches to service and care. The eBook was launched in March, 2016 as a first step in assisting mental healthcare professionals and the Department of Health to better understand and treat dual diagnosis, to build on the knowledge the eBook contains, and to develop and share best practices. Funding for Supporting People with Dual Diagnosis was provided by the Department of Health, Government of New Brunswick. Expertise in developing the content of the eBook was provided by WMA Wellness.